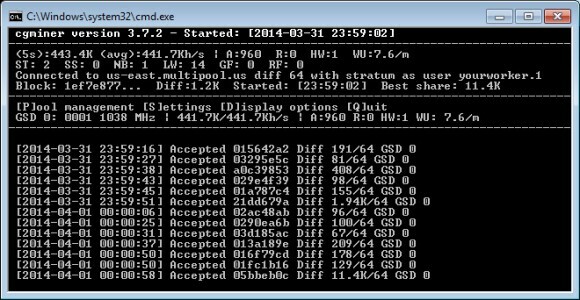 Sandor111 has released an updated version of his cpuminer fork adding a TUI (Text User Interface) containing the most important information that you would need to know for your Gridseed ASIC miners in an easy to read format (source here). Another new useful feature in the latest release is the autodetection of the number of chips, so no need to set it manually via the command line anymore. We have a windows binary available for you, and we do recommend to give it a try if you were sticking to cgminer because of the TUI available there, especially now that cpuminer also has one. If you want you can still download the previous cpuminer for Gridseed with no TUI, we’ll have it available for people that prefer to use that, and below you can download the new TUI version for windows. Gridseed ASIC users will be happy to learn that there is a new fork of the cpuminer software with support for Gridseed ASIC miners (for Scrypt only mining) thanks sandor111 over at the Bitcointalk forum. He has added support for local hashrate reporting which was one of the key missing features of the previous builds, but he did not stop at that, he has also added support for per chip frequency autotuning (automatic overclock until the best frequency is reached for each chip) and the ability to manually set frequency for each miner by using a single instance for multiple devices. There is also support for the new Gridseed G-Blade miner, you only need to set the number of chips to 40 for each of the PCBs of the Blade Miner in order for the local hashrate to be properly reported. 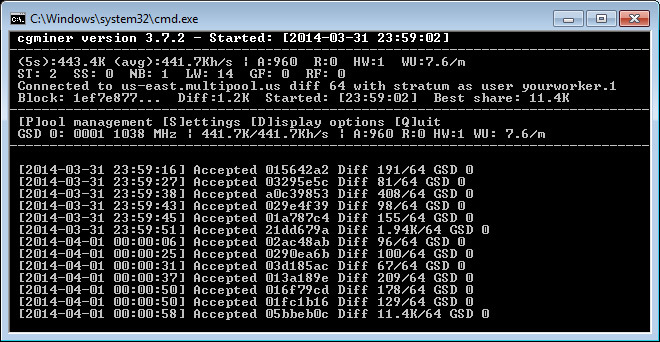 We have compiled a windows binary of the new miner and you can find the source here. Great work and essentially what the original cpuminer should’ve been from the start, and now it is finally here, simple and easy with all the right features available. 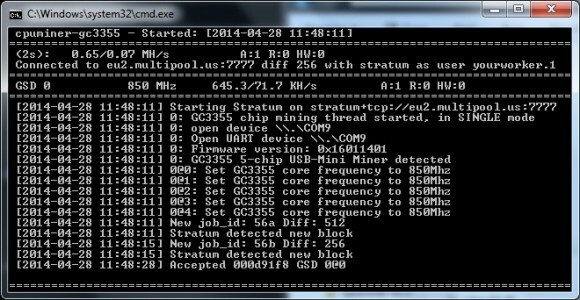 We are currently testing the new miner, especially the autotune feature, so far it seems to work quite well, but be aware that it could take some time for the miner to adjust frequencies, so make sure you set a starting frequency that is closer to what you expect that the device should be capable of. For example 850 MHz for default non modified 5-chip ASIC, 950 MHz or 1150 MHz if you have dome some sort of a voltmod already. Do check the included Readme file for a description of the options and some examples as well as for a simple, but effective Batch script for using backup pools with the miner. If you find some problem or an issue using the miner please do report it, so that it can be addressed. 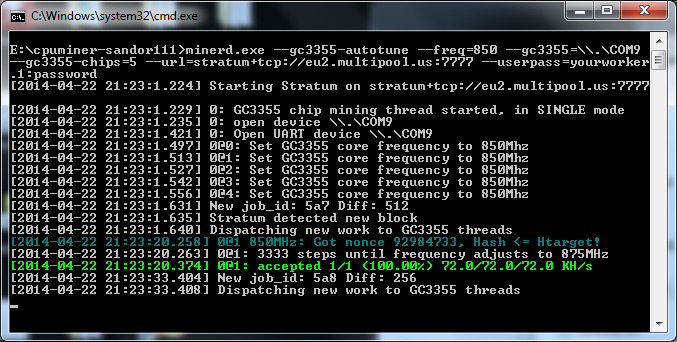 We have updated our windows builds of the cgminer 3.7.2 and cpuminer for Gridseed 5-chip GC3355 ASICs and you can download them below. Both versions include the latest official releases (cgminer source and cpuminer source) and in the source folder you can find our modified files for adding additional frequencies for overclocking if you want to compile from the source code yourself. 250, 400, 450, 500, 550, 600, 650, 700, 706, 713, 719, 725, 731, 738, 744, 750, 756, 763, 769, 775, 781, 788, 794, 800, 813, 825, 838, 850, 863, 875, 888, 900, 913, 925, 938, 950, 963, 975, 988, 1000, 1013, 1025, 1038, 1050, 1063, 1075, 1088, 1100, 1113, 1125, 1138, 1150, 1163, 1175, 1188, 1200, 1213, 1225, 1238, 1250, 1263, 1275, 1288, 1300, 1313, 1325, 1338, 1350, 1363, 1375, 1388, 1400.